If you have lost or forgotten your login details, you will need to reset them. After clicking on "Connect", click on "I lost my password": enter your username and your e-mail address. You will receive an email with a link (valid for 24h) allowing you to connect to the site to begin the reset procedure. Once you have clicked on this link a form will appear, and you can reset your login details. If you lost all your login details, including your e-mail address: Contact Digiposte Customer Services who will help you unlock your account after verifying your identity. Please put some text for you comment. Every day, your comments help to improve our services. How do I activate my Digiposte account? When you create your Digiposte account you receive an account activation email into your inbox. To complete your registration, you must click on the link or URL contained in this activation email. If you cannot find this email in your inbox, please check your junk mail (spam). After verification, if you have not received this email, please contact our Customer Services. How does the Digiposte mail work? The Digiposte email is one of the ways of filling your Digiposte Safe. By simply sending a document attached to an email (sent from your computer, a scanner connected to the Internet, etc. ), you will find the document in Digiposte. This document is then available in your Digiposte Safe in the "Personal Folder". Only the attached document is sent to the Safe. The body of the email is not. Multiple attachments can be sent in a single email. Each document will then be filed separately in the safe. The total weight of the documents must not exceed 5 MB per email. 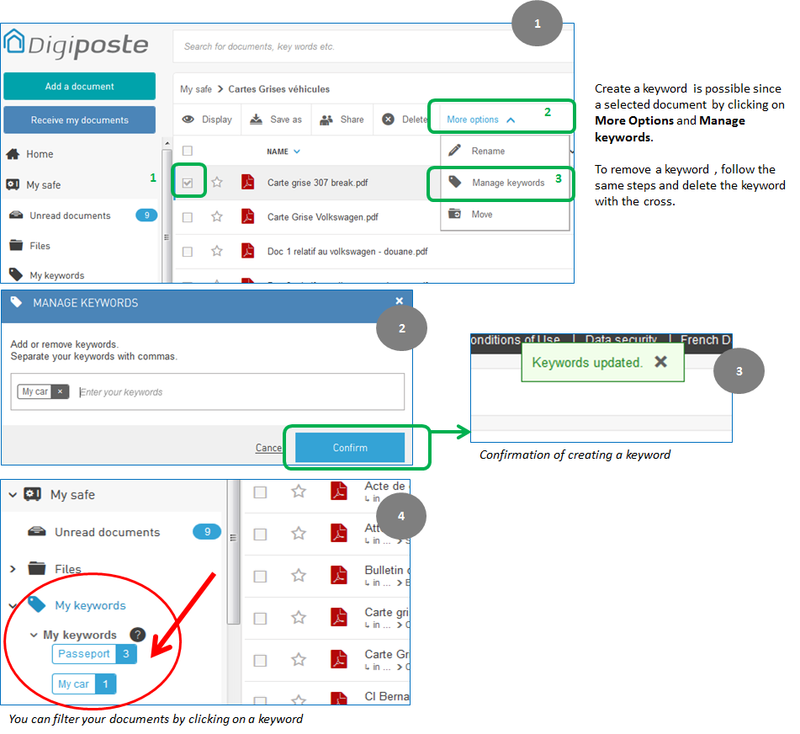 To allow you to view the document in Digiposte, we advise you to transform it to PDF beforehand. Please note that receiving documents into your Safe can take up to an hour. How do I manage keywords? In addition to folders, you can associate one or more keywords of your choice to each document of your safe. These keywords are used as personal filing system for documents of your safe. They allow you to easily find certain documents when you need them and that your safe contains a multitude. For example, if your safe contains several pieces of identities (yours and those of your children ...), you can create and associate the keyword "Identity document" to each of these documents. Documents marked with a keyword and can be placed in different folders. You simply do a search with this keyword to display all the documents which it is associated. You can create and combine several keywords to a document in order to classify et simultaneously in several categories. Since your safe, select one or more documents. In the toolbar, click More Options and then click Manage keywords. - You can add new keywords. - You can remove a keyword by clicking on the cross. To organise your documents, you can create folders. From My Safe, click the Create a folder button. Enter the name of your new folder in the window that opens. The folder is added to the tree view of your Safe on which you performed the operation. How do I file a document downloaded from my computer to my Safe? assign keywords so that it can be sorted and searched for more easily. You can file a document in a folder and assign keywords to it. For example, if you download mobile phone bills, you can create a Telephone folder and link the following keywords to it: bill, mobile phone operator name, date, etc. How can I increase my storage capacity ? You can only subscribe to the PREMIUM offer via the Digiposte + mobile application available from the Apple App Store (for models with IOS), or from the Google Play Store (for models using Android). Once you have installed your Digiposte + application, you can increase the storage capacity, the number of online oraganisations and the number of synchronised banks by subscribing to the PREMIUM offer under the heading My Offer in the My Profile section. Your purchase will be directly debited from your iTunes or Google Play Store account (depending which you have). To validate your payment, you must enter your Apple or Google password. The subscription is renewed automatically unless you cancel it via your Apple or Google account no later than 24 hours before the subscritption's due date. prepare your actions (renewal of an identity card, property purchase or sale, sports club registration, etc.) on line. Digiposte is available, subject to having internet access, from a PC, smartphone, tablet or mobile Digiposte app. You can easily and at any time access documents that you have stored on your account. By default in Digiposte, the storage capacity is limited to 5 gigabytes (5GB) provided free of charge. You can only increase your storage capacity to 20 gigabytes (20GB) via the Digiposte Pass mobile app. Adding storage space costs €11.99 including VAT per year. Digiposte Pass mobile application is accessible from Apple App Store (IOS models) or from Google Play Store (Android models).